Latest transfer news Arsenal closing on Geoffrey: Kondogbia deal Arsenal are coming closer to seal the deal of Monaco star midfielder Geoffrey Kondogbia, as per Daily Star. 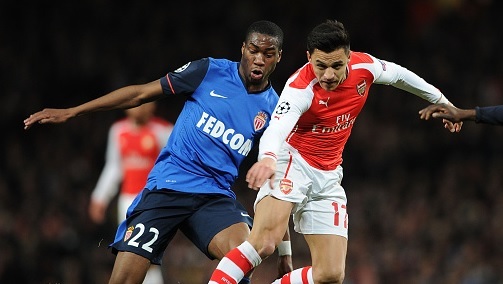 Arsenal are coming closer to seal the deal of Monaco star midfielder Geoffrey Kondogbia, as per Daily Star. The English reports claimed that Arsenal manager Arsene Wenger is in talks with his former side over the potential move of the youngster. The reports have linked Arsenal with several midfielders including Kondogbia. The AS Monaco star player spent a wonderful last season in Ligue One. The 22-year-old made 3.1 tackles, 2.5 interceptions per match in his 23 league games. Kondogbia was also the part of Monaco squad when they defeated Arsenal in the knockout round of Champions League earlier this year. Chelsea, Manchester United and Liverpool are also said to be interested in his move along with Serie A side AC Milan. Reports from last week claimed that AC Milan would be his next destination, however the recent from Daily Star have said that Arsenal are leading the race at the moment. Also, Sky Italia journalist Gianluca Di Marzio revealed that both Inter Milan and AC Milan are in the race but now will face tough fight from the Gunners. Arsenal boss is confident that he will seal this deal in the coming week. The fee would be around 20 million pounds. Meanwhile, Arsenal forward Lukas Podolski is closing on a move to Turkish giants Galatasaray. Read full story: Podolski set to join Galatasaray.